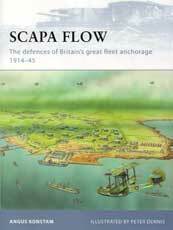 A strategically important natural harbor in the Orkney Islands, Scapa Flow served as Britain's main fleet anchorage during World Wars I and II. It held Jellicoe's Grand Fleet from 1914-18, and it was from here that it sailed out to do battle with the Germans at Jutland in 1916. In 1914 the British began building a comprehensive defensive network by fortifying the entrances to Scapa Flow and then extending these defenses to cover most of Orkney. These static defenses were augmented with boom nets, naval patrols and minefields, creating the largest fortified naval base in the world.